Hello and welcome to another Stamping Techniques To Try blog hop featuring designers from around the globe, all of whom are Stampin' Up! Demonstrators. 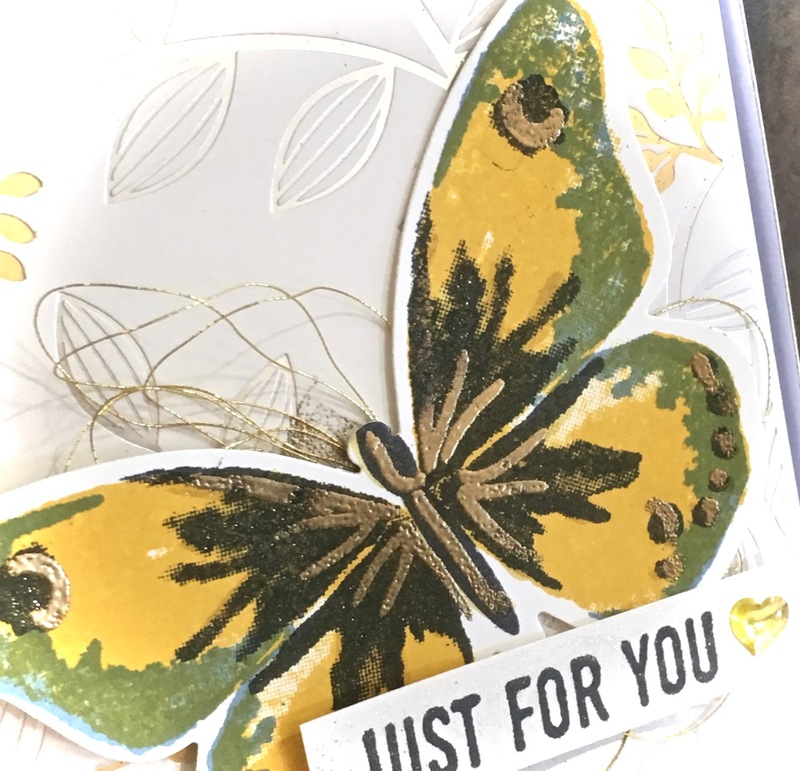 This month we have the wonderful technique of 2 or 3 step stamping - now this might sound difficult and look a little complicated but it is quite easy and gives you a really professional finish to your cards. I have chosen to use a stamp set from the Stampin' Up! Annual Catalogue - Watercolor Wings. 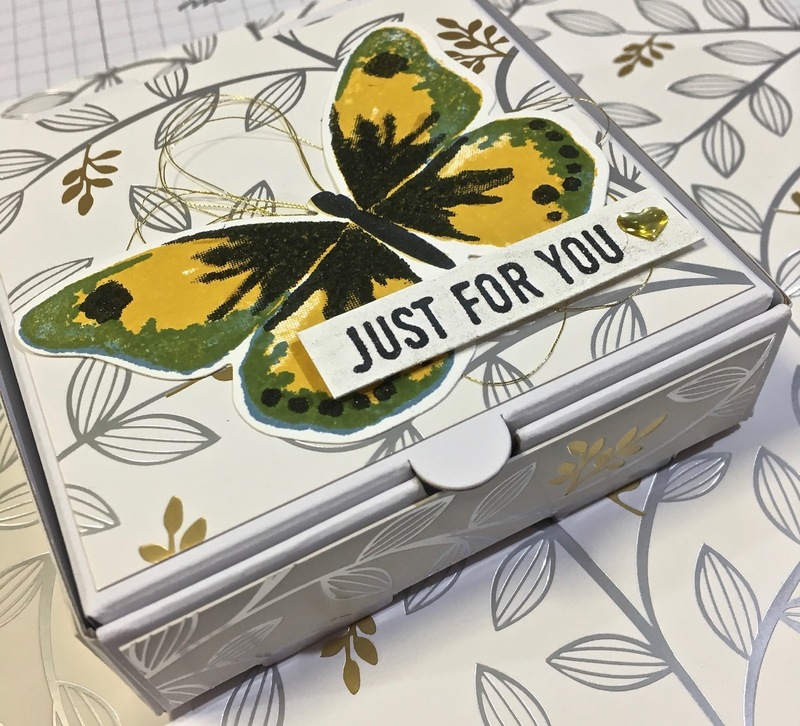 This is a versatile set consisting of 15 photopolymer stamps, and the image I used coordinates with the Bold Butterfly Framelits. 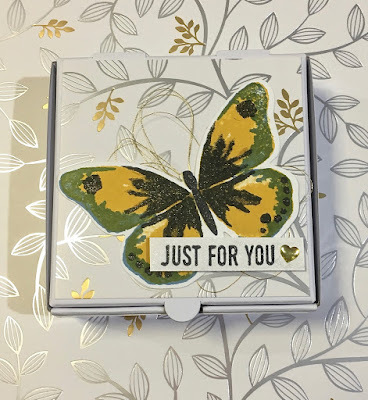 I used this image as a design element for the top of a Mini Pizza Box that will contain a variety of butterflies to use as embellishments on cards, scrap pages etc. Colours I used are Crushed Curry, Marina Mist and Memento Black. The Marina Mist turns to a lovely green when stamped over the top of the Crushed Curry. 1. 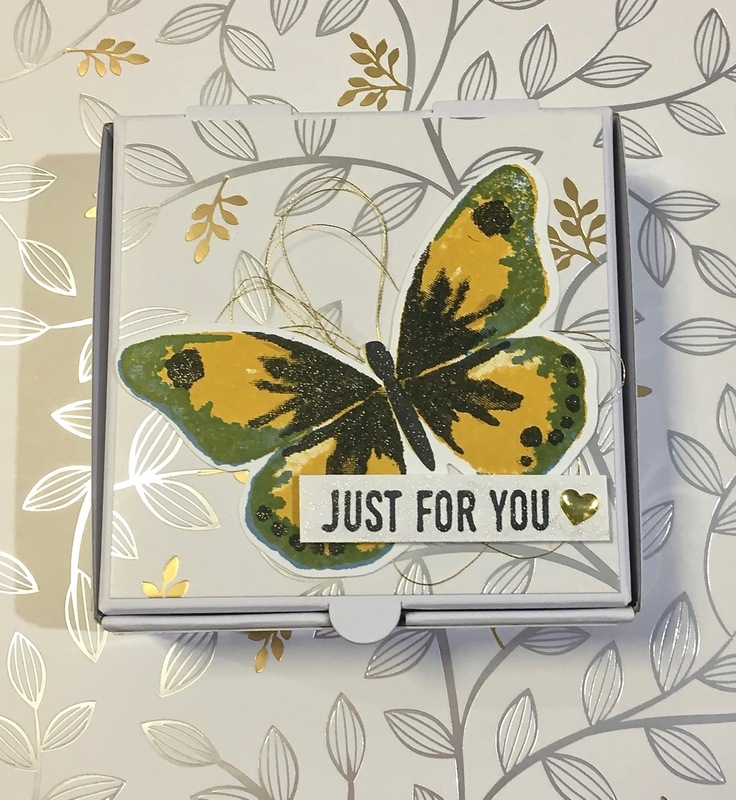 Stamp the base image of the butterfly using Stampin' Up! Crushed Curry Classic Ink. 2. Align the next stamp by placing it directly on top of the first stamped image, turn the Stamparatus perspex panel over and press gently to allow the stamp to adhere to the perspex. 3. Ink the stamp using Mariner Mist Classic Ink and press down over the first image. Perfect alignment! 4. 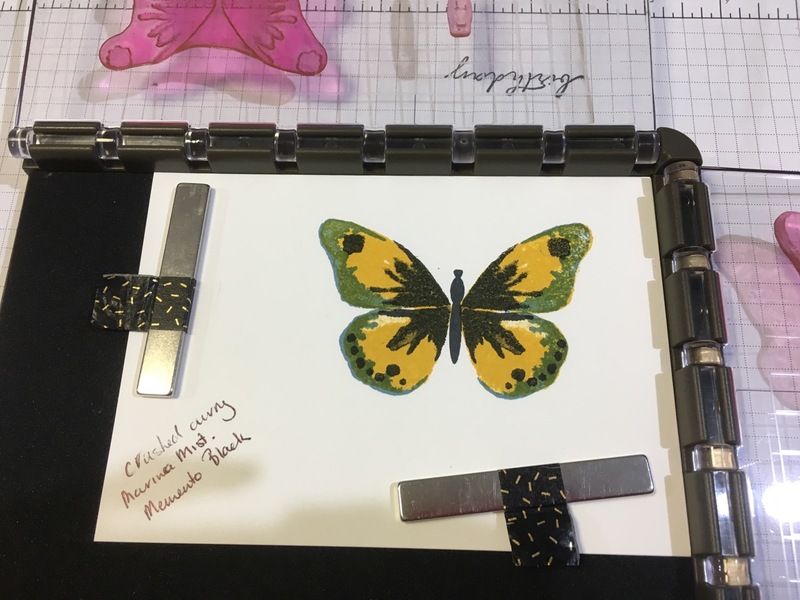 Place the most detailed image stamp (the black inked area) over the 2 steps already stamped, use the other perspex panel at the top of the Stamparatus, press the panel down onto the stamp, lift up, ink with Memento Black and press gently down again - your image is now complete except for the butterfly body. 5. Turn the second panel over, and adhere the body stamp using the same method as mentioned above. 6. Cut the butterfly image out using the Big Shot and the Bold Butterfly Framelits. I am a lucky owner of the wonderful new Stampin' Up! placement tool - the Stamparatus and it is amazing how magical this tool is for aligning 2, 3 or even 4 step stamped images. The 2 clear plates enable you to align up to 4 images by turning the plates around. 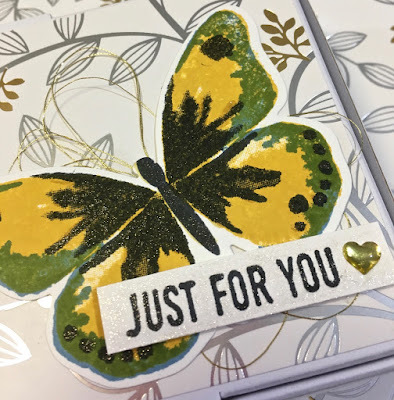 This means you can stamp lots of butterflies in a variety of colours without moving your stamps. I have to say I am totally in love with this tool. I used the beautiful Springtime Foils Specialty Designer Series Paper to cover the top and 4 sides of the box. This was a free offering in the second release of SALE-A-BRATION items. I wasn't going to waste any on the base of the box as it is just too beautiful to be on the bottom of anything! The page I chose has both gold and silver embossed images of leaves. My butterfly looked a little dull compared to this beautiful paper, so I blinged it up a little with a Clear Wink of Stella, hints of gold embossing and some fine Gold Metallic thread under the butterfly. I hope you will try some 2 or 3 step stamping. It is so much fun and gives really professional results. If you would like to order any of the products I used you can just click on the images in the product list below and you will be taken to my On-line Store. 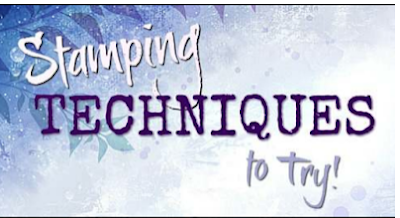 Now you should hop along to the next blog to see some more awesome ideas for 2 or 3 step stamping. Just select the name after mine - Ann Craig - and let us know what you think about the designs. We love to hear your comments!